What a day! A huge thank you to everyone who joined us at the 61st Annual Mount Michael Benedictine Fall Festival. The Fall Festival is a special event and it's always a wonderful reminder of what an amazing community we have! Thank you for volunteering your time in order to support our monastic community. 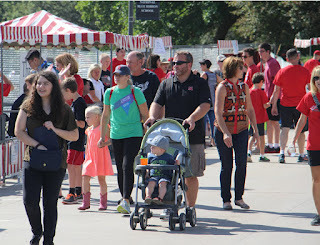 Whether you volunteered at a food booth, made a donation, set-up, baked cakes, cleaned-up, helped at a game booth, loaded a hay-rack ride, tore-down, or helped a guest feel welcome -- everyone was an integral part of making the event a success!